Today Otis and I made these cute little Christmas tree meringues as gifts for our friends and neighbours, and perhaps a few for the Christmas table too. The idea came from our favourite macaron shop Marché du Macaron, although we made ours much smaller, almost bite size. As it should be when baking with children, they turned out perfectly imperfect. The recipe is really simple, we used Margaret Fulton's (Australian cooking icon) recipe using only three large egg whites and 1 cup of caster sugar. While the egg whites and sugar were being whisked in the electric mixer we put in a few drops of green food colouring. Once the egg whites formed a stiff peak we put the whisked egg whites in a piping bag to make small Christmas trees. We put on the baubles (hundreds and thousands) before putting them in the oven. Because ours were so small we only baked them for 30-40 minutes. They taste delicious and are a nice and colourful alternative to the usual cookies or gingerbread. We may have started a new tradition! From my family to yours, we wish you a safe and joyous Christmas! Why choose passive toys? Passive toys are toys or materials that do nothing unless the child initiates play, the child must use them, manipulate them for them to work. There is no 'on' switch. Passive toys require the child to use them and therefore can spark the child's curiosity, ignite the child's imagination, encourage the child to ask questions, explore and be an active learner. The child can play with them, manipulate them and come to understand them. We want toys that the young child can explore, we want toys that make sense and don't act in a random or unexpected way. We want toys that teach children about the world and help them to gain not only an understanding of their environment but of themselves. We don't want toys that the young child can't understand such as those with batteries, a motor or that wind-up. While they might provide entertainment, the entertainment is shallow, it doesn't give the child any knowledge or develop any skill. Active toys can teach children to be passive, to expect to be entertained. Passive toys teach concrete concepts such as gravity, cause and effect, how things work and fit together (often mathematical relationships), they can help develop coordination and concentration, develop fine and gross motor skills. Passive toys can teach children perseverance, problem solving and investigative skills. All the child needs is the toys or materials, space and long periods of free uninterrupted play! I haven't written a gift guide for infants but you may get some ideas from a previous post Gift Ideas for a one-year-old. As you will find in some of the articles below, many lovely play-things aren't toys at all, but household items that present investigation and learning opportunities. The Best Toys for Babies Don't Do Anything at Magda Gerber. Passive toys make active learners at Let the Children Play. Better Toys for Busy Babies at Janet Lansbury. There's A Huge Problem With Kids' Toys That No One's Talking About at the Huffington Post. Too many toys are bad for children, study suggests at The Telegraph. 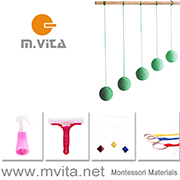 Toy Store vs Montessori Materials at How we Montessori. Notes to a Montessori Parent. Torn between Idealism and Reality. "I am a firm believer in the Montessori method, but I do recognize its collision with reality at times. My experience is that the reality is not that following the Montessori method would result in a self-centered child. Rather, it is extremely difficult for parents to truly carry out the Montessori methods. The deep respect for the child that Maria Montessori promoted is very challenging to implement in a daily life with young children, especially when parents are overwhelmed with balancing work and home. I fail constantly and it pains me greatly. The introspection and humility required in a Montessori parent sometimes go directly against our human psyche. How do we parents balance following the child with being an effective leader amidst so much weaknesses and imperfections in ourselves?" Parent from the Heart first. This is the only way to be honest and true to yourself. If it doesn't feel right, don't do it. There have been lots of minor and not so minor decisions we've made along the way from weaning, sleep to finding a school for the boys, but first and foremost was how the decision made me feel inside, what felt right. Reading about Montessori has given me lots of guidance, ideas and inspiration but my personal goal has never been to be a Montessori parent but the best parent I can be at any given time. Give yourself time. A friend of mine and parent at our school recently shared how she is having trouble staying calm and not snapping or yelling at her boys. I find our parenting styles to be similar however I could see that she wasn't giving herself time. Her children were testing her and she was reacting without giving herself time to consider a response. I'm not going to suggest counting to ten or taking a deep breath but just give yourself time, then parent from the heart. Don't take it personally. My friend as mentioned above spoke of one situation where her children were acting in a completely age appropriate, testing the limits kind of way. It should be expected. Yet her response was personal, emotive and hurtful. It can be difficult to take the heat out of the moment but keep in mind your children's behaviour most often will not be aimed at you personally, most often they will be acting in an age-appropriate way, most children will test their parents, they will push the boundaries they need to know where they are. Not taking it personally can change the way that we react. Don't feel the pressure to conform. You need to parent in a way that is true to you, and possibly your partner. Sure, talk to teachers, read books and blogs maybe, talk a lot to friends and parents of your children's friends, gather ideas, hear how others approach different issues, but don't feel the pressure to conform, don't feel like you have to be like or act like anyone else or do something just because it's the Montessori way of doing it, it has to make sense to you! Allow your children to see your flaws. If we pretend we are perfect our children will get an unrealistic view of the world. I am socially awkward and often let my children see this and sometimes laugh about it afterwards. I own up to my mistakes in front of my children. I apologize to them for when things have gone wrong. Handle difficult situations with grace, we all make mistakes it's how we handle them that counts. You set the tone. You as the parent set the tone of your home. You can have a calm home in times of stress, I know you can. You can slow down your home life in a fast-paced world. Over the years I've got to know a lot of Montessori parents, teachers and bloggers and feel like there is never an intent to apply pressure to parent in a specific way or to be free from fault, rather the intent is to support and provide ideas and suggestions to others. If you are feeling frustrated, like you are failing or you are feeling undue pressure, let me know, perhaps there is a way we can support each other. My Top Parenting Book of 2017! + At what age do you allow your children to free-range? Do you feel the pull to get your children outdoors more? My children spend time outdoors but often it is at my request or during organized activities. I want to create a culture, a family norm where we have regular, unstructured play outdoors that is entirely child led. There's No Such Thing As Bad Weather: A Scandinavian Mom's Secrets for Raising Healthy, Resilient and Confident Kids (from Friluftsliv to Hygge) has been life-changing for me. I listened to it as an audiobook (mostly while doing those school runs). It's written by a parent, not by a parenting expert, and it's just what I needed to not only get my children outdoors more but allow them to free-range. This is a book about one parent's journey in America and Sweden with her two children. It's lighthearted and a pleasure to listen to. It's fascinating to hear how different the cultures (American and Swedish) are and how this impacts our parenting, our children and eventually our health. It also highlights that as parents we can work really hard to develop an outdoors culture but the environment and society around us are really important, for example, our school outdoor play policies and even the policies governing access to our public places (such as nature parks) have a huge impact. Listening to this book makes me desperately want to move to Sweden! The author offers some valuable tips that we can implement straight away, and others will be useful in our move to the UK including information on how to layer clothing for outdoor play in the cold and snow. There are tips on sleeping babies outdoors to teaching environmentalism from eating organic, local, fair trade, composting, reduce, reuse and recycle. I loved the sections in which the author discusses her community and the importance of being surrounded by like-minded parents and also her discussion on being proactive in her community. It is to be noted that this isn't a how-to guide, it is more of a personal journey with lessons that we can all take on board. The first change I made in our home was to implement daily outside play, I wanted to make it a habit and it was something we were lacking since Otto has been born (he's now three months old). I've learnt that with children, doing something daily eventually makes it a habit. It's worked with the boys doing things like emptying their lunchboxes after school, I request that they do it every day and within a week or so they just do it out of habit. Sure enough a week or so of asking the boys to play outdoors after school they begin doing it without asking. It should be noted the boys hike weekly with their Dad, this is always special 'Dad time' but I'm sure it instills a connection to nature. The second change I made was to allow the boys to free-range and go to the park by themselves. This was and still is huge for our family. It's a big deal to allow your children out in the world by themselves without any adult supervision. We have some rules such as how far they can go and that they must under all circumstances stay together. Caspar is 10 and Otis is 6 so I feel that there is more harm in not allowing them, than allowing them this opportunity. We took it slowly, first, we would all go to the park and I would go home and ask them to come home in five minutes. Then I had them go to the park and I would meet them there ten to fifteen minutes later. A slow start gave me confidence. Since allowing them this opportunity I feel like they have grown in maturity and have a sense of pride about going out by themselves. They have been spending much more time outdoors and their play has changed too, they have become much more creative rather than just playing on the park play equipment. This makes outdoor play and exploration the norm, this allows the children to become independent and have consistent and longer periods of time outdoors as they are not reliant on an adult, and it provides for new social and environmental (learning and connectedness) opportunities. I've listened to and read a lot of parenting books this year but this one is my number one, mainly because of the impact it's had on our family. I'd love to hear if your children free-range or walk to the park or to school by themselves and at what age they started! I wouldn't allow Otis out by himself but we allow him to go with his brother. Perhaps it depends on your neighborhood or the temperament of your child? Do you have any magnetic letters at home? Magnetic letters on our fridge really helped my children to casually practice the spelling of their name and other short words. Using magnetic letters at home is a great way for the child to practice their literacy skills without duplicating or replicating work done at school. I like having them available simply for the child to play or tinker with when they like! If your child is going to a Montessori school or if you are following Montessori at home, I recommend starting with lower case letters. I love to follow the Montessori tradition of using the red and blue letters. If unsure ask your child's teacher, some schools use red consonants and some use red vowels. We initially used the Melissa and Doug Alphabet magnets and later used the Magnetic Movable Alphabet (Australia). Here are a few other more Montessori orientated options. 1. Magnetic Learning Letters - Lower Case - Learning Resources. 2. AlphaMagnets - Lowercase - Educational Insights. 3. Large Movable Alphabet - Magnetic from Wood Puzzles (Australia), these are the ones we have used with Otis since he was around two years old. We still have these letters on our children's fridge. They are made in Queensland which is fabulous, you can choose your own colors and script type too! 4. Jolly Phonics Magnetic Letters - Jolly Phonics (Australia). 5. Magnetic Lowercase Movable Alphabet with Box - Alison's Montessori. Alison's Montessori also have this Magnetic Alphabet which is really affordable. 6. Colour-coded Magnetic Letter Kit - EZread. 7. Classroom Magnetic Letters Kit - Lakeshore Learning. (Australia here). 8. Word Building Magnetic Letters - Lowercase - Lakeshore Learning. 9. Wooden Alphabet Magnets - Little Masterpeaces (Etsy). short shopping list "apples", "bananas"
short messages "Happy Birthday", "I love you", "Merry Christmas". Sometimes we would have a whole lot of letters just floating around on the fridge but usually we keep the tray of letters nearby! For a simple DIY, I have seen the printable Movable Alphabet used effectively with magnets applied to the back. I believe the best 'Montessori' activities for Christmas including baking Christmas treats (always Gingerbread!) and making gifts by hand. We LOVE Christmas themed playdough and Christmas puzzles! Here are a few other ideas to bring some Christmas to your Montessori shelves at home, homeschool or school! Above toddler language cards at Montessori and Me. What's different Christmas cards by Maria Schavez. Christmas Mystery Bag by Maria Schavez. 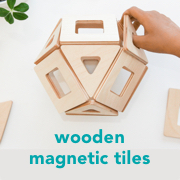 Maria has lots of Montessori inspired Christmas ideas! Initial sound work, free printables and lots of other Christmas ideas at Montessori Nature. Christmas themed Knobless Cylinder work. I know some teachers use extension ideas like this and others don't. Also at Montessori Nature. Printable here. I love this one, Montessori Christmas three part cards + silhouette cards that can be used with the TOOBS Christmas set, which means the child (toddler/preschooler) can match object to picture or object to silhouette. Also at Teachers Pay Teachers, this Christmas matching activity. Pincer and fine motor work including dropper and Christmas tree at Cameron Park Montessori. This might be a fun one to try at home if you have some shape blocks at You Clever Monkey. Tonight I've printed the 'fill in the blanks' and crossword puzzle for my boys from the Christmas Word Wall at Montessori Print Shop (works out just over $2 AUD), I think they'll enjoy it! I hope you've found some useful ideas! Daydreaming... What is in your dream Montessori Nursery? If resources or location weren't an issue, what would be in your Montessori Nursery? It's not a tough question for me as it's something that I've thought about many times. I might be a bit obsessed but I'm sure I'm not the only one! I don't know if it's a positive or a negative, but with our move, I get to start our Montessori nursery all over again. We are taking some toys and materials but it's too expensive and unrealistic to ship Otto's current furniture. So I've been daydreaming. It will be much easier being able to shop in the UK and Europe where there are many more Montessori furniture options. We can't paint the walls but we can use removable wallpaper, which I'm seriously considering (I love this scallop design). We will be using the nursery from when Otto is four months to two years so some things like a small wardrobe, while wanted might not be necessary, we will have to re-home everything before returning to Australia. I love minimalistic Montessori rooms but admit it's probably not my style. I start off minimalistic and then overfill the shelves! I love natural timber but with lots of colour. This is what would be in my Montessori nursery! I can't wait to move and get started. Scallop Wallpaper I Reading Bench I Children's Stool I Low Infant Shelf I Wooden Barn I Green Floor Rug (I would have used this here if we weren't moving, it's so soft and perfect for infants) I Montessori Bed I Child Low Library I Montessori Weaning Table and Chair (I would probably order similar from here) I Large Ball Tracker I Wall Mirror with Pull Up Bar. When Otis was little I loved lists like this. Not because I felt like I needed to do all of the activities suggested, but because it gave me some simple ideas to try at home. I hope you find this list just as useful. This is a no pressure list, you might find it more suitable for your child at two months or three or four months. The age is a guide only, work at your child's pace and always meet them where they are at. Here are ten things you can do at home with your Montessori baby at two months. Mobiles. Continue to use a mobile. At two months you may want to move away from using the high contrast black and white mobiles and introduce mobiles with colour and depth such as the Octahedron or Gobbi mobiles. Towards the third month look for signs your child is batting at the mobiles. If they are batting, you may want to prepare some tactile mobiles such as a bell or ring on a ribbon. Change the mobiles to meet your infant's changing visual needs and to keep their interest. Wall Mirror. Continue to use a mirror for observation. A mirror and playmat really help to promote movement and soon coordinated movement, concentration and visual tracking. Free Play. Provide lots of periods of free, uninterrupted play. Allow the child time and space, give them the freedom as much as possible to be in control of their own environment. Perhaps try some nappy free time, I've found this to be a good way to promote movement (use a sheet protector, towel or puddle pad for protection). Free play promotes concentration and helps strengthen attention spans. It also shows the child respect, we respect you enough to give you your own space and time where we are not going to dictate what you are going to do, we trust you and we believe in you. Most often we do this in the movement area on a playmat. Playgym. Provide a playgym with hanging toys, a bell or a grasping ring. Towards the end of two months, Otto loves nothing better than batting at (and spinning) his woven ball (with a bell). Tummy Time. Try some tummy time. Both our paediatrician and paediatric physiotherapist recommend it as does every Montessori guide and teacher I've spoken to about it. Tummy time provides an opportunity to strengthen back and neck muscles and to see the world in a different position. Otto loves tummy time and we follow his lead, at around nine weeks he could roll independently from his tummy onto his back, so it's a position he can now get out of. During tummy time we aim to have his legs (knees and feet) free from clothing so he can grip his toes into the mat and push himself. We do tummy time in front of a mirror, in the movement area, with a sibling, outdoors on a playmat, almost anywhere. During this period the child may be able to lift their head up and look around the room, they can't do this lying on their back. Grasping. Prepare materials for grasping such as some small beads or a bell rattle. Look around your craft store as you may be able to make something suitable, if not Etsy has lots of good Montessori materials. If your child isn't ready for grasping materials now, it's likely they will be soon. At this age, the grasp is most likely a reflex but offering grasping materials may help this develop into a controlled movement. Infant Massage. Try infant massage. For some children, this can be incredibly soothing and calming and can be a bonding experience. For our family infant massage is a good way for us to slow down with our infant, to take a few deep breaths and make slow and deliberate movements. It calms me as much as it does my child! Observe your child to see how they respond. Use an infant massage oil or simple olive or almond oil. There is lots of information about the importance of touch, it's worth thinking about. With the help of our physio we've also learnt to do some body mapping and this has been invaluable. Infant massage can also assist the child with body awareness. Follow Cues. This is so important in the Montessori philosophy. Continue to learn and follow the child's cues. Observe the infant, slow down, find peace. We have continued to maintain contact with the maternal points of reference and allowed Otto to feed on demand and sleep following his own natural rhythm. With each child I find I am able to pick up on their cues better, it can take time and patience. Talking. Try talking to your infant emulating their sounds. I didn't try this with my other children but we are having a lot of success with Otto. Like in this video. Otto is very vocal and I believe it's because we are responding to him and most importantly when we talk to him, we are giving him the time and opportunity to respond!! Many infants can't get a word in when their parents are talking to them, to pause is important. We are loving hearing his little voice, it brings so much joy. Include Them. There is a focus in Montessori on including infants in everyday life. At two months the infant is not mobile so we generally do this by using a movable playmat or lambswool around the house. We allow the infant to be near and a part of the family's activities, for example lying or playing next to siblings. I find a baby carrier a great way to do this when out of the house, the infant is still close but can also see your mouth and observe your interactions. Want a few more ideas? Water Play. The bath is a great place for this, I have found infants around this age love splashing, especially their feet. It's a good way to cool down on a summer's day too. Read. Books can introduce rhyme and rhythm, it can also be a lovely way to slow down and spend some time together. Sing, Dance, Move. There is no doubt that children love to hear their parents voices and singing is a way to communicate and it can help soothe the infant too. Infants may like movement and feeling the beat while dancing, observe and follow their cues. Go Outside. Grab a playmat or blanket and put it outside in the shade. Lie there and just be, enjoy the outdoors with your little one! Allow for concentration. Children can't concentrate unless we allow them. Some parents are just so busy there is no time for the child to concentrate on anything. If during free play, under a mobile or playgym or while using the wall mirror, the child is concentrating, do your best not to interrupt them. Avoid always using the television or playing music around the infant. sleeping for longer periods at night (he usually has at least one six-hour stretch and sometimes up to eight hours). There is a clear difference between his sleep during the day and night. being more observant, looking around. looking at his hands, rotating his wrists, opening and closing his hands and fingers. beginning to reach but still unable to pick up items, he will move or push items around. having lots of success batting at toys on his playgym (towards the end of two months). babbling and a lot of reciprocal talking. having longer and longer periods of happy tummy time. slithering forwards during tummy time. finding a rhythm, he is generally sleeping at the same times and needing nappy changes at the same time of day. You might also find useful Ten Things To Do With Your Montessori Newborn. Please feel free to add to this list if there is something I have missed, it might just help another parent! I am hoping to write one of these lists every month, while Otto is in that period, it's difficult to write them any other way, these are all activities we are doing and enjoying today! You can read my articles from when Otis was two months old here. If you are looking for books to read on the Montessori infant I suggest Understanding the Human Being and The Joyful Child.